A creamy texture, beautifully red, and rich in flavour! 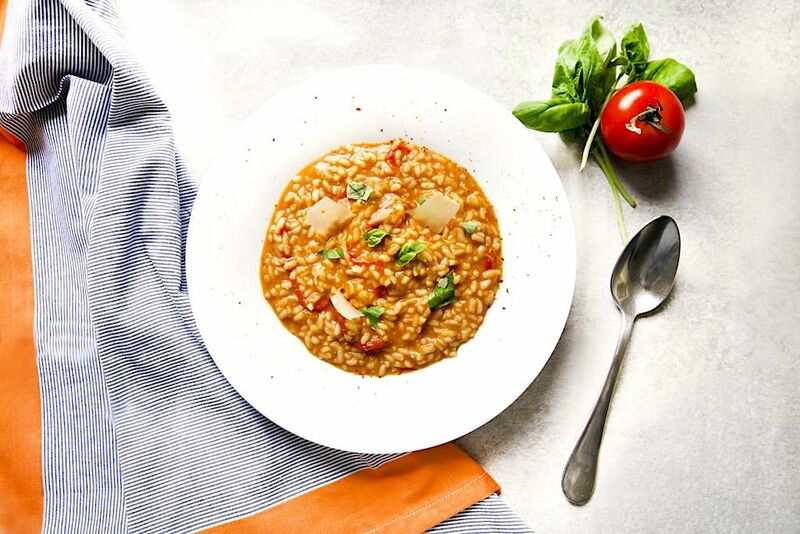 This vegetarian risotto recipe has fresh and light ingredients, and is an explosion of flavour. It will make you want to go for seconds. When I think of risotto, I picture an amazing Italian favourite, but sometimes with butter, cream, or mascarpone among the ingredients. Those ingredients are too rich for my taste. I like low calorie cuisine, rich in flavour. 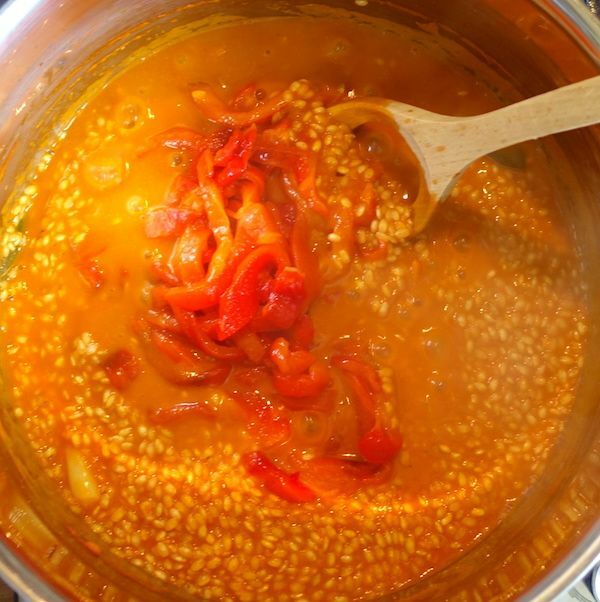 What gives most of the flavour to this recipe is the tomato sauce therefore, it’s a good idea to make it from scratch. 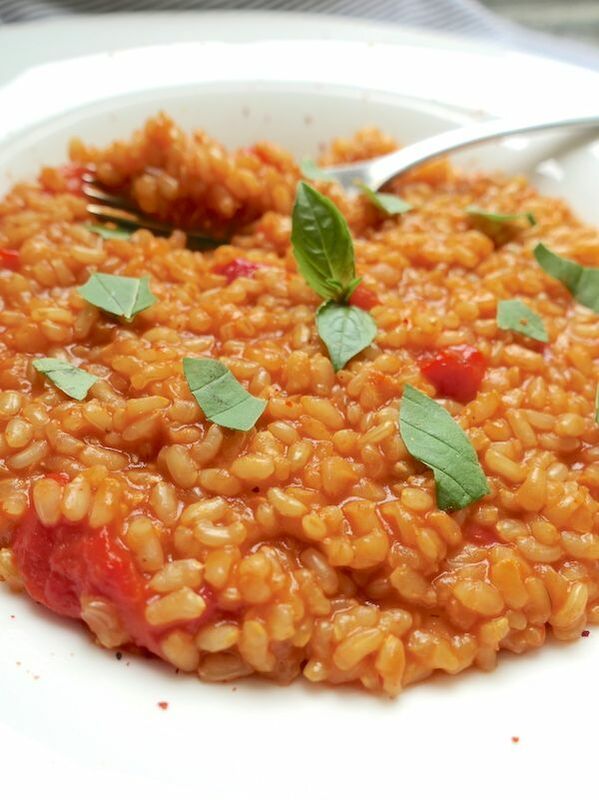 Arborio rice will result in a creamier and moist texture, whereas brown rice will be drier with a nuttier flavour. Up to you! 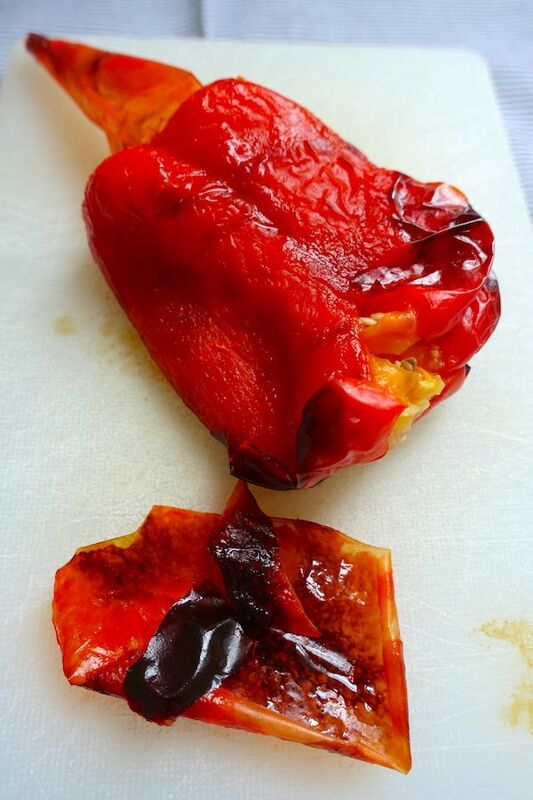 Grill the bell peppers on all sides until the skin is blackened and blistered all over. Place in a bowl and cover with damp paper towel for about ten minutes. 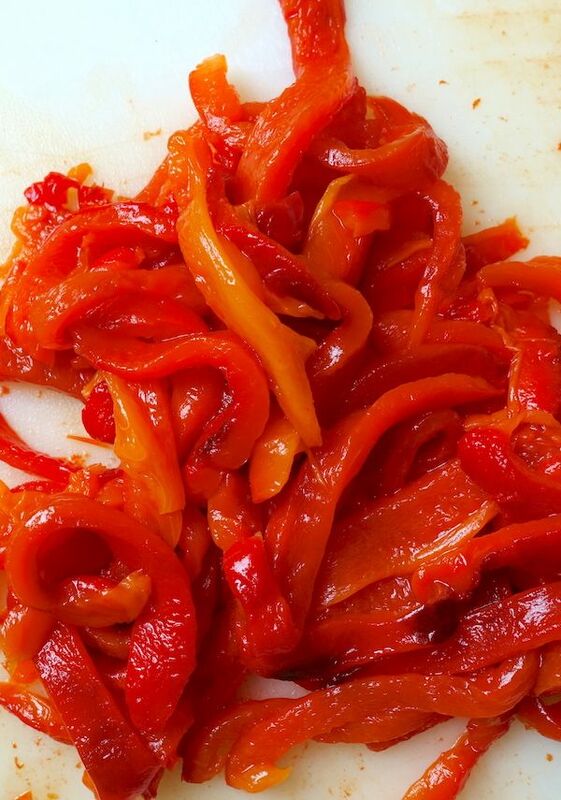 Peel off skin, remove seeds and cores and slice in julienne (thin stripes). Bring vegetable stock to a simmer. In a saucepan heat olive oil and peeled garlic cloves to medium heat. Do not colour the garlic but move the cloves around to release and mix flavours. Reserve the third garlic clove. Peel and chop shallot, add to the saucepan, and stir. Rinse tomatoes, cut in eight, and add them to the saucepan. Add crushed garlic clove, bay leaves, balsamic vinegar, and a pinch of dried tarragon. Cook in low heat. 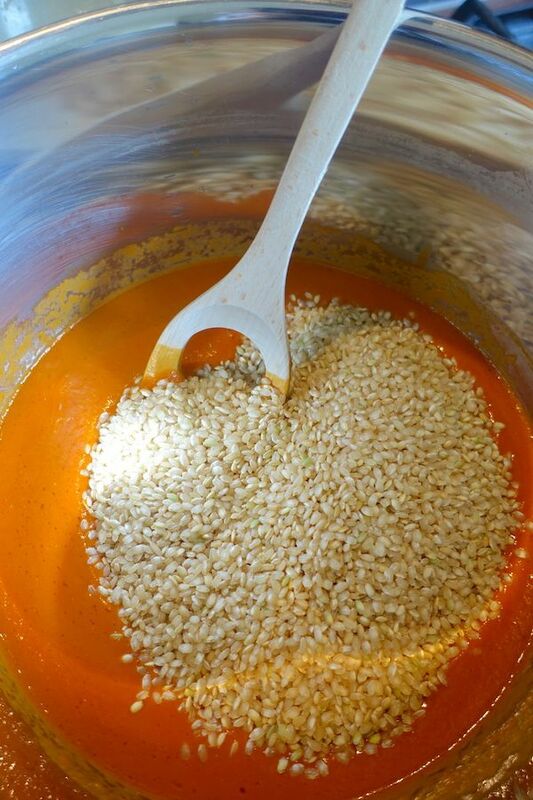 When tomatoes are cooked and start to become a puree, remove bay leaves and whole garlic cloves, pour the mix in a blender and blend well. At this point you may choose to use the sauce as is, or to put it through a sieve to get rid of the tomato skin. I personally like it with the skin to get more fibre and nutrients. Pour the sauce back in the saucepan, add the bay leaves and the whole garlic cloves. 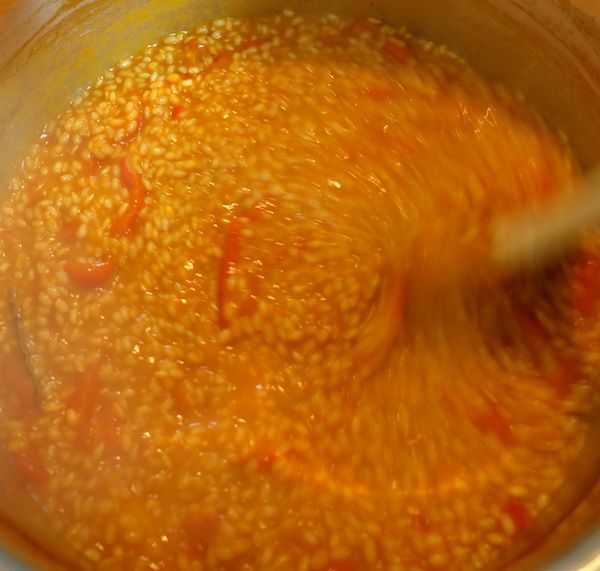 Add rice and cooked bell peppers in julienne to the saucepan with the tomato sauce, garlic cloves and bay leaves, and mix well. Add vegetable stock just to cover the rice and stir until the liquid is absorbed. 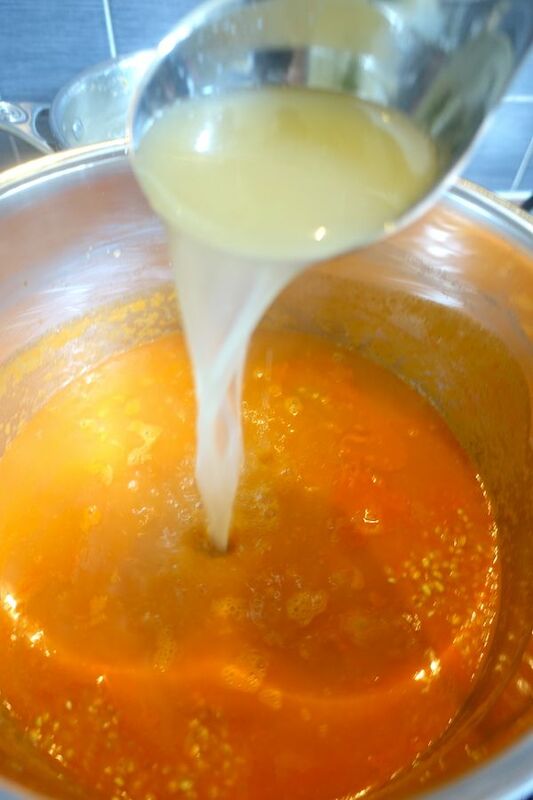 Continue adding stock, two ladles at a time stirring until the liquid is absorbed. When the rice is tender, season with salt, pepper, and a pinch cayenne pepper. Remove from the heat, cover and let stand for ten minutes. I love to serve it in a soup plate and garnish with basil leaves. You may also grate some Reggiano parmesan cheese to add a beautiful smell and taste. Enjoy and let me know how yours came out, in the comment section. Lima, Peru – The Land of Rich Gastronomy and Talented Chefs!